DID YOU JUST BREAK YOUR TOOTH? How serious is your injury? 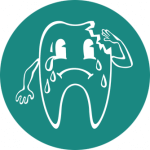 If the tooth has fractured as a result of trauma causing loss of consciousness, nausea and disorientation you need to go to a hospital emergency room for evaluation immediately. Unfortunately, there is nothing much you can do without the help of your dentist. The dentist will conduct a series of tests to evaluate the health of your tooth. The tooth may be saved with just a filling or a crown. Sometimes the nerve is exposed to which you may experience tooth pain and require a root canal treatment. Worse case scenarios are when the fracture has extended in such a way that the tooth cannot be saved at all.